A dying cat was found in a carrier bag with two dead cats and pig body parts. Lindsey Holmes found the bag in the orchard area of a field where she keeps horses in Stony Houghton, near Pleasley, Derbyshire. She said: "It was horrible. I could see three cats in the bottom of the bag and then realised one was alive." After Miss Holmes called the RSPCA, the cat was taken to a vet who put down the female tabby to "end her suffering". Miss Holmes said the bag, which she found dumped with rubbish including dirty nappies on Monday, August 27, was "shocking" to discover. She said: "It was so gory as there was also blood and body parts. I could tell it was parts of a pig by the skin. "It was so sad to find two dead cats dumped like this and it must have been awful for the one which was alive." She added that the cat was moving around but was very thin, so she took her home to feed her. 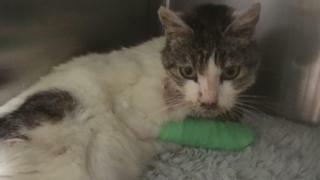 Image caption RSPCA inspector Rachel Leafe said the cat must have "suffered terribly"
The female tabby was later taken to Peak Vets, in Matlock, and was found to be dehydrated and suffering from acute renal failure. RSPCA inspector Rachel Leafe said the cat was found in such a bad way that she must have "suffered terribly". She said: "It is disgusting. We don't know if the two cats were dead when they were left in the carrier bag or not. "It is despicable that someone could do this and I am keen to trace the person responsible." Anyone with information should contact the RSPCA.